Three Oaks Cider Co. has a new addition to their cider range, releasing their new 8% ABV Crushed Apple Cider from the Adelaide Hills. The higher alcohol level isn’t overpowering, instead it’s well balanced with perfectly ripe and juicy fruit characters. “Freshly crushed Red Delicious apple aromas continue onto the palate and combine with Pink Lady’s effervescent juiciness and just a hint of tartness from our Granny Smith apples” said Lange, “Well rounded, Three Oaks 8% Crushed Apple has a crisp, medium dry finish”. 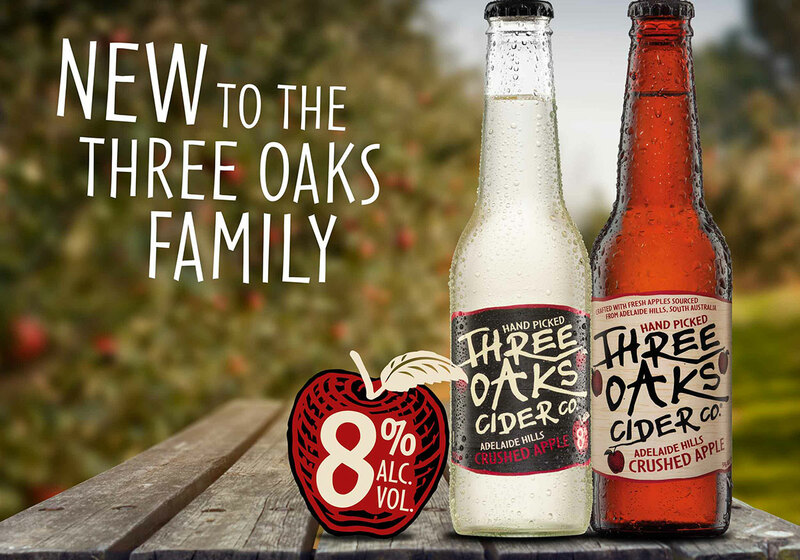 The new Three Oaks Cider 8% Crushed Apple Cider is available in Dan Murphy’s and Liquorland retailers in 275ml bottle (4 pack) and through selected Independent retailers in a 375ml can (10 pack) format.